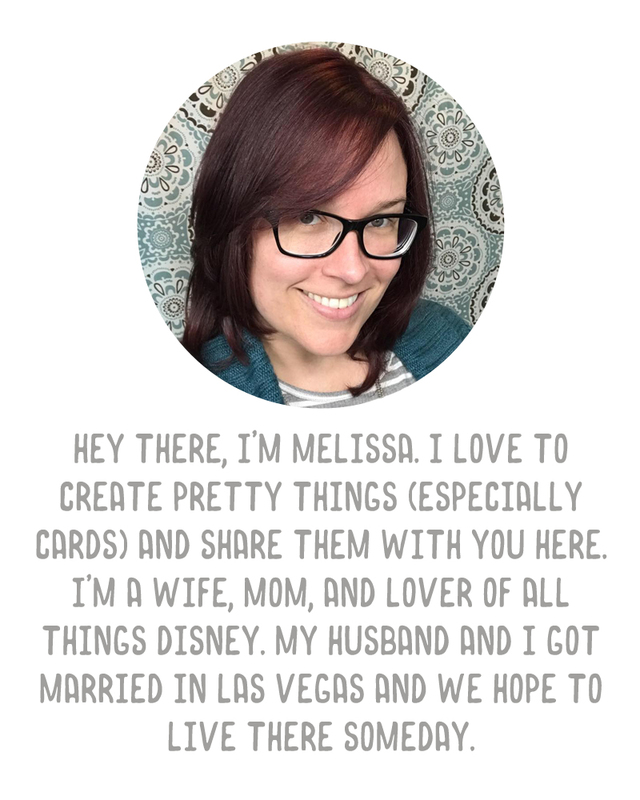 A Vegas Girl at Heart: Clear Stamp Set No. 1 Giveaway! Clear Stamp Set No. 1 Giveaway! My set of photopolymer clear stamps that I introduced to you last week are now available for purchase in my shop. These are $6.99/set $7.00/set and ship for $1 to the US, $2 to Canada, and $3 anywhere else. The size of the set is 3"x4". UPDATE: I've had some issues with this particular item this week and people purchasing it. Those who purchased there was something up in their paypal transaction that PayPal and Storenvy couldn't figure out, and at least one person could not purchase it at all. The only difference between this item and any other item in my shop is the 99 cents at the ending so I've had to change it to $7.00. I am SO sorry for the extra penny, but I really hope this fixes the errors. I have sold digital items as well as another physical item this week without any problems, so this is the only thing I can think of that would be causing it. I've spoken with PayPal and Storenvy directly and neither could offer any help at all. I have now also changed the link to my Etsy shop. These are packaged inside a clear resealable bag which is placed inside a handmade kraft paper envelope. Sealed with a little sticker made with these stamps, of course. I wanted these stamps to be versatile and this week I plan to show you several different ways to use them. Today I want to show you some embellishments I made using the stamps. 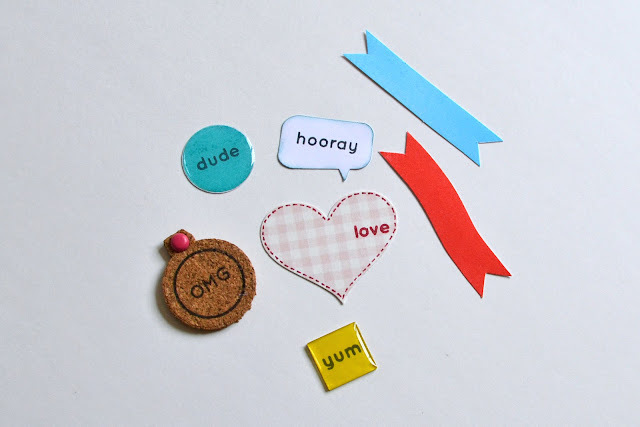 I made epoxy embellishments using my Epiphany Crafts punches, a cork tag using a Stampin' Up! Framelit and a pink brad, some banners (you can curve the banner stamp on your stamping block like I did to get a curvy pennant) and a super cute heart that I punched out of patterned paper and stamped "love" on. These are just some ideas for embellishments you can make using these stamps. 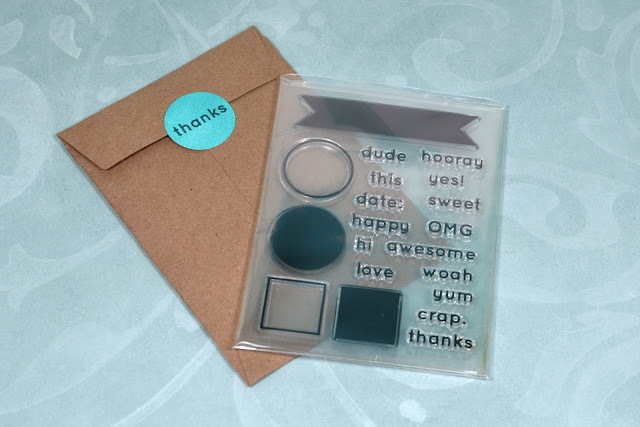 Some things to note: clear stamps are used with a clear acrylic block. You can get these at Michaels or on Amazon, or any craft store that sells clear stamps. I have found lots of them for just $1 in the bargain bins at Michaels and Joann's. I find pigment ink pads work best with the solid stamps, but any ink pad will work with the text and outlines. (I use Memento brand mostly-and I used that on the cork as well). Do not use StazOn with clear stamps. StazOn will stain your stamps, as it's a solvent based ink. Clean them with a mild soap and water. (I use my homemade stamp cleaner which is water, baby shampoo, and glycerin). Simply leave a comment on this post with your first name and last initial, and your city/state or country and one reader will win one of these sets. This is open to anyone, anywhere. Entries close at 11:59PM EST Sunday, June 30, 2013. I'll announce a winner on Monday, July 1st. UPDATE: Giveaway is now CLOSED. If you can't wait and just want to go purchase this set for yourself, you can grab it right here in my shop. Congrats on the new stamps! They are fantastic! Thanks for the chance! They don't stain? I used stazon on a few of mine (not these) and they stained. I am in love with these stamps! Thanks for the chance to win! Thanks for the chance to win a cool stamp set ! Would love to win these clear stamps! What a cute set! Thanks for the chance to win! Love this stamp set. Thanks for the chance to win it. Congratulations, These are really cool. Cute and versatile stamps! Thanks for opportunity to win! Love love love this stamp set! Thanks so much for the giveaway! OMG, these are AWESOME DUDE!!! See, I'm already ready to use the cute little stamps!! Fabulous stamp set and I LOVE the packaging! Thanks for the chance to win. Love how you made these embellishments! These are really fabulous stamps and such a reasonable price compared to what many others are charging. I'm over in the UK and follow your blog religiously for my Project Life inspiration ( I'm new to scrapping and project life). Those are really cute stamps. Thanks for the chance. Super cute!! Would love to win! You know I don't stamp or anything, but I just wanted to tell you how adorable these came out! I especially love the cork. Amazing work. I also love that epoxy thing you have, they look so awesome. Congrats on these awesome stamps! They are beautiful! Very Versatile Set! Love the different uses you posted with this set so far. Would love to win a set. Love these! Thanks for the chance to win!!! Congratulations on your stamp set! I love the little banner! Thanks for the chance to win. Congratulations on your first (hopefully, of many) stamp sets. So looking forward to adding this set to my stash - love the "CRAP" one (sold me)!! Congrats on your stamps. They are perfect for Project Life, which I just started and have enjoyed your blog on the journey. Entry for Brenda, UK. (Couldn't enter herself).